No posts for the forseeable future, will be back on the other side. If you’re hungry for thoughts on and translations of Chinese and Sinophone fiction, there are bountyful menus available from wonderful Paper Republic and WritingChinese. Ling Hon Lam encourages us to think of emotions in terms of space; when we sympathize with a character in a play or feel something for another person, that emotion takes place, for it moves us outside ourselves. In Chinese this relation between space and emotion is described by the term qingjing; a scenery of feeling or in Ling’s translation an “emotion-realm”. In Spatiality of Emotion in Early Modern China, Ling presents a critical history of Chinese theatre evolving from early religious performances without human audiences, through the introduction of sympathetic spectatorship to a new understanding of theatricality in a Chinese context. Through his “genealogies” of various aspects of Chinese theatricality—often described in relation to their European counterparts—human emotions are recast as external events that take place between individuals rather than within a subject. Ling introduces to Anglophone readers the concept of emotion-realm (qingjing 情景) to describe this external emotive situation. The word qingjing, when used in daily language, refers simply to a situation or a state of affairs, but by breaking up the term and translating each character literally as qing = emotion and jing = realm or landscape, the resulting concept of “emotion-realm” enhances the focus on human feeling in relation to space. Historically, Ling explains, the connection between emotion and spatiality in theatre was brought about through the introduction of spectatorship and the construction of sympathy in the spectator. Where ritual dream theatre was performed only for the gods or the diseased, the introduction of human spectators who could recognize and sympathize with the events on stage created an intermediate space or “emotion-realm” between the dream world of the drama and the experiential world of the viewer. Due to its ambitious scope and serious engagement with previous scholarship as well as its insistence on linking concepts of theatricality to ontological philosophical discourse, Ling’s book is an extremely demanding read, which requires some degree of patience, especially in the non-specialist reader, with long convoluted sentences of highly abstract meaning. The four core chapters are very well-researched and combine critical readings of classical Chinese dramas with contemporary theories and concepts from object ontology and affect theory to gender and performance studies. Chinese terms and models are introduced and used in dialogue with English and German terminology in innovative and enlightening ways, for example in the deconstruction of the phrase sheshen chudi 设身处地 (putting oneself in the other’s situation) in comparison with Einfühlung and sympathy. The prologue and parts of the final chapter, however, depart from the historically informed genealogies of the core chapters to engage in semi-philosophical discussions, in which Heideggerian arguments are used as premises for conclusions without being themselves critically assessed. While the connection of space and emotion in the term “emotion-realm” is both interesting and pioneering when used in concrete analysis, the prolonged abstract discussion of it in terms of 20th century European philosophy, but without the internal logic of philosophical argument, seems less useful. Spatiality of Emotion in Early Modern China is a heavy read with rewarding and informative rabbit holes into the development of essential aspects of Chinese drama in comparison with their European counterparts. The book combines an extensive knowledge of theatre history with a creative use of contemporary theory to critically re-examine the formation of spectatorship and theatricality in a Chinese context. On October 13th, the Taiwan Studies Workshop ‘Ecologizing Taiwan: Nature, Society, Culture’ organised by Michelle Yeh and David Der-wei Wang took place at University of California, Davis. Inspired by Felix Guattari’s The Three Ecologies, the workshop sought to “extend the definition of ecology to encompass social relations and human subjectivity, as well as environmental concerns”. Ten scholars from across the US and one from faraway Sweden (basking in the Californian sun and finding it a bit hard to focus on academic pursuits) presented their work on aspects of contemporary Taiwanese culture and history in relation to various interpretations of ecology. Ling Zhang from SUNY-Purchase shared her research on aural strategies in Chen Yingzhen’s novellas, including narrative voice, ambient sounds and collective singing. Pao-Chen Tang from University of Chicago presented an analysis of Hou Hsiao-Hsien’s film The Assassin from 2015, which focused partly on the animal qualities strived for in martial arts practice and partly on the autistic features of the film’s protagonist and how they enhance her professional prowess. However, it also touched on supersensitivity as a motif in hit man films as well as a stereotype in the representation of people with autism. Under the title ‘Urban Ecologies: The Flora and Fauna of Fictional Taipei’, I presented my work on the role of plants as markers of place and ethnicity in Chu Tien-hsin’s 朱天心 ‘The old Capital’ 古都 together with the interspecies communities described in Wu Ming-yi’s 吳明益 short stories about Taipei. My aim was to add an urban dimension to the flourishing discussion about ecoriticism in Taiwanese literature and to argue that the city presents not only a possible but an essential site for human engagement with the so-called ‘natural environment’. Furthermore, I think fictional narratives offer new and less discipline specific ways of engaging with human beings and their curious ant heap cities as part of, rather than anti-thesis to, nature and nature writing (自然写作). All photos taken by me in Taipei, April 2017.
Review of “Contemporary Taiwanese Women Writers: An Anthology”, edited by Jonathan Stalling, Lin Tai-man and Yanwing Leung. These stories describe Taiwanese society from 1980s to 2010s (with the notable exception of the final story “The Fish”, which—dating from 1976 and dealing with the Cultural Revolution in mainland China—hangs on like an out of place appendix) and thus also touch on the tremendous changes in economy, politics and lifestyle that took place during those years. This anthology therefore does its bit to redress the balance. 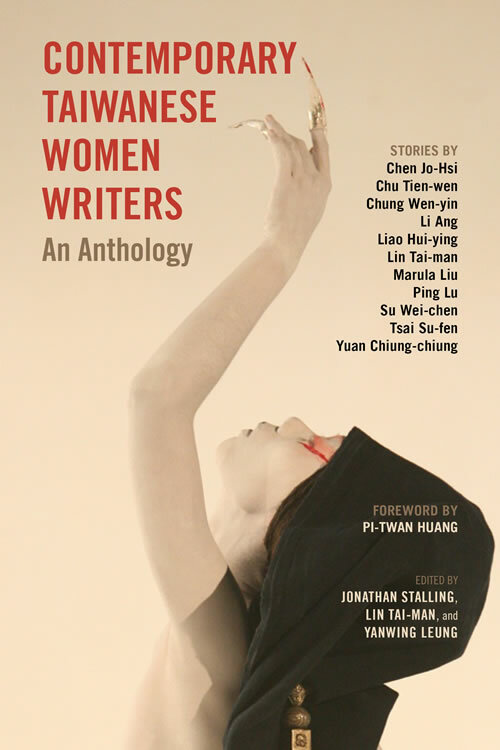 And from a Sinophone perspective, it bears witness to the remarkably rich literary scene in Taiwan as well as to the fact that a not insignificant number of the island’s best authors happen to be female. For some time, it has been dawning on me that what I am really interested in is not so much what is written in and about China (as the old name of this blog writingchina would seem to suggest), but rather all sorts of narrative fiction written in the Chinese script(s). (I dare say the intelligent reader will have noticed this long before I did). Taiwanese nature writing, postcolonial Hong Kong concept lit, Sinophone fantasies from European backwaters, Southeast Asian urban fables, Shanghai quotidian novels, borderless online scribleries in simplified character slang: I want to investigate and celebrate all of it! The term xiaoshuo 小说 – which today means any kind of narrative fiction writing, from novels (long fiction 长篇小说) to novellas (medium fiction 中篇小说), short stories (short fiction 短篇小说) and flash fiction (tiny fiction 小小说) – has a long and complicated history in Chinese culture. The essentially diminutive term xiaoshuo (literally small talk), used traditionally to refer (somewhat derogatorily) to “minor philosophical discourse or a type of unofficial, inferior history” (Lu: 39), with strong negative connotations of rumour and gossip rather than of pure fabrication and artful creation as in the latin fictio. Several scholars (see below) have written fascinating accounts of how the xiaoshuo genre (as well as the attitudes toward it) developed from Confucian warnings against its deceitful nature and the notoriety (and popularity) of the strange and supernatural zhiguai tales to the canonised masterpieces of Ming/Qing serial fiction and today’s cyber romances. Lu, Sheldon Hsiao-peng (1994): From Historicity to Fictionality – The Chinese Poetics of Narrative. Zeitlin, Judith (2006): ‘Xiaoshuo’ in Moretti, Franco (ed. ): The Novel: History, geography, and culture. Some literary works excite us because their linguistic fabric is so rich; each sentence describes not only an event or an action, but a way of thinking through language and narrative, a way of looking at, living in and representing the world, full of cultural residue, philosophical implications, personal memories and associative capacity. How can we as (would be) literary translators encompass both syntactic melody, narrative pace, semantic connotations, metaphoric content and intertextual aspects of our source texts while rendering them at all readable in our target language? Last week, I attended a workshop organised by Rakel Haslund-Gjerrild and Mai Corlin Bagger-Petersen at University of Copenhagen, featuring experienced and new translators of Chinese fiction into Danish, which addressed these daunting questions. Professor emeritus of Chinese language and literature, Anne Wedell-Wedellsborg used Franco Moretti’s allegory of translation as waves that bring new life to the shores of national literatures, while the renowned Danish translator of James Joyce and Herta Müller, Karsten Sand Iversen stressed the importance of integration rather than assimilation as a method for translation. This strategy includes avoiding what Iversen referred to as ‘normalisation’; the act of trivialising inventive and even weird literary language, in order to satisfy editors and the perceived cultural laziness of prospective audiences. Danish translator of Haruki Murakami’s works, Mette Holm described the collaborative efforts of translators around the world to deal with the complexity as well as the specificity of fictional narrative: On the one hand, translators must understand and retain the literary ambiguity of Murakami’s texts, his fantastic elements, his literary subconscious, while on the other, they struggle to incorporate his use of highly specific brand names, sometimes unknown or unnamed in the target language. Most translators from Chinese, including Susanne Posborg and Sidse Laugesen, agreed that the issue of dialects, idioms and jargon represented a huge hurdle in terms of translation. One cannot simply interpolate Danish dialects for Chinese, as the whole fictional geography clearly does not conform to the cultural sphere known as Denmark. Conversely, more subtle differentiations might go unnoticed by the casual reader. Despite all the difficulties and challenges to good translation practice raised by the speakers (a commercial book market with, according to Klim publishers‘ representative, an active readership of only about half a million was another factor that was mentioned), the all-day workshop was very well attended by old hands and young students alike, a fact that seems to raise hope for the future of literary translation from Chinese in Denmark.